We did everything through the computer (no one-on-one), but it was very clear. It gave all the details we needed and things were just as they said they would be. The house was in a great location for us. It was the perfect size for the two of us. The only problem we had was with the shower. There was not enough water flow and it only trickled out. Have always enjoyed doing business with CVR - have rented several different places over the past 4 years or so, and they are always as good or better than expected. Love the ease of renting, check-in and check-out. The house was beautiful and clean - just as pictured. Loved having a complete kitchen! It was too warm to use the fireplace, but we enjoyed mornings on the deck and watching night time thunderstorms over the lake and harbor. Cobblestone Cove is also convenient - we were able to walk downtown and out to Artist Point and the Lighthouse. We really enjoyed the home and the location was perfect for our weekend plans . Absolutely lovely, comfortable, beautiful, well stocked. Incredible view. 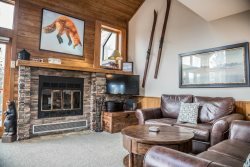 We stayed at Fox Cove 9/14/2018 to 9/16/2018. Its a darling little cottage off highway 61 in Lutsen. The cottage really does have all you need. Nice sitting area to view the lake. The cottage it self is well appointed. The beds were really comfortable.I only gave this 4 stars because the fireplace should be working..I mean who has a fireplace in a North Shore cottage and it doesn't work? Also, they need to up the game with the furniture. My daughter sat in one of the peeling black chairs, and when she got up it left black peeled leather all over the backs of her legs. They also should replace the (sofa chair) with a real small L shape sofa. And put in better towels. The rental went very smoothly .Plenty of information. Heaven Sent is a very comfortable house with fantastic views and plenty of large windows. Its quiet and very peaceful. Our family has used Cascade Vacation Rentals since 2008 and have had nothing but great experiences. Great location, perfect house with amazing views!!! The reservation process is super easy and we enjoyed the amenities like the pool and spa and deck. We had a wonderful stay at this property. We enjoyed the nicely decorated room and fully stocked kitchen. The view of the lake was beautiful, especially at sunrise. Organized very well, no problems. The cabin itself and the location were excellent. The pine interior is in very good shape as was everything in the kitchen. The porch is great for sitting out in the evening. Good to have some appropriate personal communication when needed on specific issues. Nice cozy unit. Second year we stayed at this one. Updated with practical interior. Really enjoy our time there whenever we visit. Wonderful house and location. Having the lake so close is awesome.